Hyundai Santa Fe SUV his a tree head-on while apparently traveling northbound on Windsor just after 3:00 a.m. Saturday. 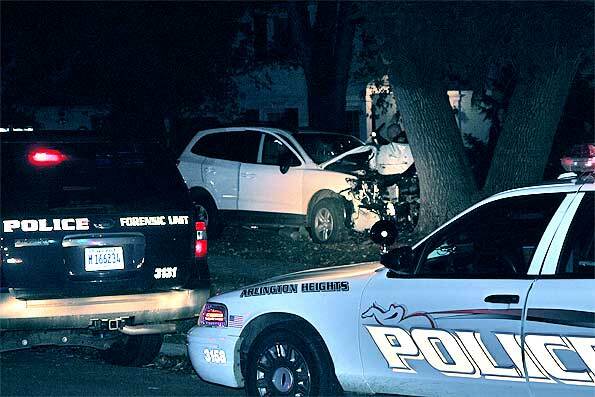 Arlington Heights police responded to the call for the sound of a loud car crash in the area of Windsor and Kensington about 3:10 a.m. Saturday. The driver could be heard yelling for help after the accident. Police arrived in the area and found a crash on the southwest corner of Windsor and Kensington Road. A white Hyundai Santa Fe hit a large tree in the front yard. Arlington Heights Fire Department firefighter/paramedics transported the accident victim to Northwest Community Hospital. The crash was the third one-car accident with major damage to a vehicle overnight. The crash was also the third accident involving a one-car crash into a tree in four days. There is possibly an arrest in this case. 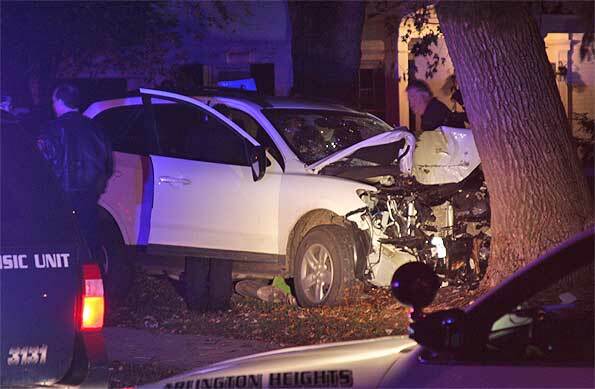 Police investigate the interior of a vehicle that struck a tree very early Saturday morning in the Stonegate neighborhood of Arlington Heights. 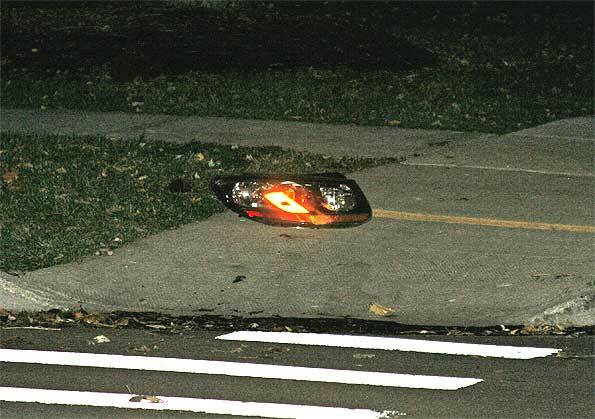 Headlight enclosure to the Hyundai Santa Fe landed on the southwest corner of Kensington and Windsor near the crosswalk — about 40 feet from the point of impact with the tree. Arlington Heights police are investigating the accident. The crash is the third crash into a tree in four days with severe damage to vehicles. The first recent crash was in the 1400 block of West Miner, the second recent crash was on Arlington Heights at about 10:40 p.m. Friday. In another one-car crash, a DUI driver turned his Nissan 330z down the railroad tracks at Arlington Heights Road and severely damaged the vehicle. Marker shows point of impact of Hyundai Santa Fe with tree near Windsor and Kensington.